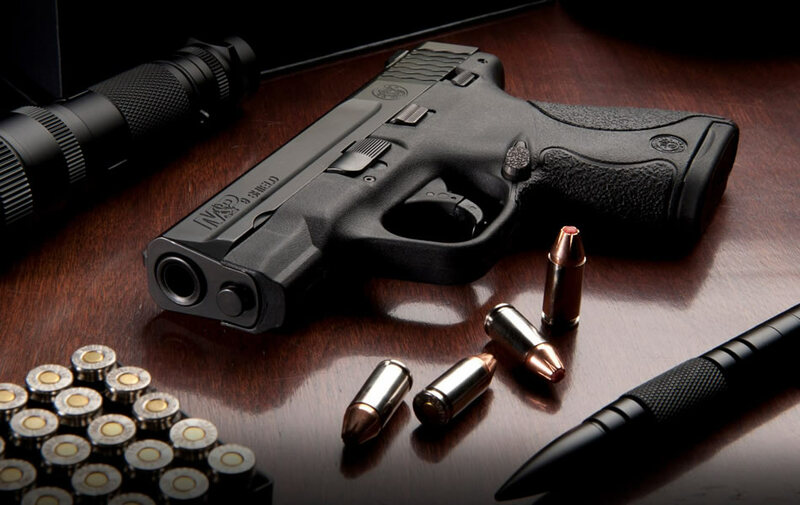 A slim, concealable and lightweight design combined with the proven and trusted features found in the M&P Pistol Series. From the easily concealed one-inch profile to its optimized 18-degree grip angle, the M&P Shield offers professional-grade features that will provide you with simple operation and reliable performance. The M&P Shield also features a quick and audible reset made possible by the striker-fired action, allowing multiple rounds to be placed on target both consistently and accurately. And it’s all backed by Smith & Wesson’s Lifetime Service Policy. S&W durability. From the optimized 18-degree grip angle providing a natural point of aim, to the best-in-class M&P durability – the M&P Shield is a professional-grade, conceal carry pistol designed to shoot as well as it conceals. Shield advantages. The M&P Shield combines all of the fine-tuned advantages that make M&P pistols comfortable to shoot with a slim, one-inch profile for comfortable carry. (5 out of 5) I love mine! I love mine! No problem! Carry it every day. I wish I could get to the range more with it. I would get it again. I recommend it. I’m waiting for the SW Shield 45 ACP W/thumb safety to go on sale. I have shot over 500 rounds and no problems. Shoots and handles with ease. I would buy it again. (5 out of 5) Get two! By far the best striker fired handgun on market today. Don't be fooled by some of these other reviews. These are great handguns and statistics prove it! I love mine!!! This is an amazing weapon at an amazing price. Shipped and was in my possession in about 4 days. Very happy and will be buying more from SOSS. Buy with confidence. (5 out of 5) Shields are Great! I've purchased 3 Shields in the last year. The price is incredible and they are the perfect everyday carry weapon. I carry a .40 with no safety. I purchased two 9mms with safeties for my younger brothers who recently got permits. They love them. Perfect pistol for IWB everyday carry! (5 out of 5) Excellent price and value. The police trade-in M&P 9C was listed in good condition but I would have considered it to be very good or better. The gun was almost pristine and must have seen very little use. It ran perfectly with the 100 rounds I put through it and should work well for years to come. (5 out of 5) Great Conceiled Carry.. The purchase from Sportsman's Outdoor Superstore could not have gone smoother. I ordered it online, and picked it up from my FFL a few days later. I have been carrying this M&P Shield 9mm for about 9 months. I have put several thousand rounds through it. I have and do trust my life, and my family's life to this weapon. Thank you SOSS! What a great carry gun which has never let me down. This little M&P Shield was bought for my wife to carry about 180 mos. ago. I am a CCW Instructor and carry a Glock 27. We went to buy her a Glock 43, but when she shot the M&P she was sold. After the purchase, of course I had to BREAK IT IN and that is when I became a true SHIELD fan. It has handled about 400-500 rds. of ALL different ammo Personal Defense to reloads with absolutely ZERO problems. It was and still is deadly accurate right out of the box. I am considering a M&P SHIELD for my everyday carry because of its slim imprint, REASONABLE price, and my experience with this gun. I love my Glocks, but do not snub this S&W. (5 out of 5) Good place to buy. This was my first time purchasing a handgun online. I was very pleased with the entire process! Received my purchase quickly and without blemish. A polite Customer Service Rep quickly answered a question I had post delivery- Thankful for competent reps to speak with, as opposed to the frustration of getting automated voice recordings to answer “FAQs.” 250 rounds through this M&P Shield 9mm, and I’m enjoying it more and more with each pull of the trigger. Not sure what other reviewers situations were but I have to say I was extremely impressed with my purchase. Price was the best I could find with included options. Made a mistake when ordering and put wrong zip on FFLs address. Called left a message. Called again in 30 minutes and talked to someone. They fixed it right away. About a hour later they called to return my message I had left asking to speak to someone. Ordered on the Wednesday before Thanksgiving and the FFL received it today. Gun was new in pristine condition. No blemishes. Order was complete. FFL also received some other orders from SOSS and I watched him check them in and record the ser#s. All the guns looked immaculate. FFL was so impressed he is going to look at SOSS to purchase the same gun I did. I will definitely look at SOSS first on my next gun purchase and recommend them to all my friends. While I didn't purchase THIS gun from SOS, I bought it from my cousin, I have purchased 2 rifles from them. This pistol is very nice, shoots accurately despite the short barrel. I've had zero malfunctions with this pistol and have run a couple hundred rounds through it. Because of how much I like this gun, I will be buying a full size M&P9 2.0 within the next couple months. Great Gun, this was my 2nd gun I purchased from SOS. no complaints shipped fast was satisfied. Picked this handgun up because of nice sale price and $75.00 rebate. Great deal and very happy with size, feel and performance at my outdoor gun range. Have put 300 rounds of FMJ ammo through it with no failures or problems of any kind! Like the thumb safety too. I was turned on to the 9mm Shield at my conceal carry class by the instructor who let me fire his. Just a fantastic firearm. It's no wonder S&W have sold over a MILLION of them. Great trigger response. Get it. I have both Glock 43 and M&P Shield. While they are more different than similar, I like both guns. If the price is the major deciding factor, you simply cannot go wrong with Shield. Great gun, solidly built, reliable, feels good in the hand. Comes with both flush and extended mag with extra rounds compared to the Glock. Recoil is no worse than other sub-compact pistols. Two cons are: I really dislike S&W trigger in general, although they are do-able and one can get use to them. Also, the slide is very hard to rack. If you have weak hands, you will hate this gun. Got this for my wife and she loves everything about it, except racking the slide and loading the magazines. I concur with her as the slide is the toughest one of all our firearms and the magazine loading is horrible even for me. But this doesn't take anything away from the function and accuracy of this handgun. Therefore only -1 out of 5. Hands down one of the best compact 9mm handguns I've ever owned. I've put over 2000 rounds through mine with no Failures or hiccups. Love the added thumb safety, the trigger has a bit of a safety feature to it which I don't mind , just glad it isn't the horrendous Glock style . Only thing I must note is both magazines that come with the shield are a little bit hard to seat into the Magwell. I figured out that the plastic butts on the magazines needed to be sanded down some and now they fit perfectly and I don't have to slam them in. Overall extremely happy with this gun, and ever happier, with the awesome service and rebates made known to me by this website . Sportsmans outdoor superstore is the best place online to buy a firearm. Bought 2 S&W shields, 1 for me and 1 for the wife. I've got the full size M&P 9mm, and have always liked it. The shields didn't disappoint. A great CC firearm, and a great transaction with Sportsman. They shipped pronto, and we will definitely be buying more from them. First off I want to thank Sportsman's for them being the best online gun sellers!! They had best price on Shield and it was shipped in a timely manner. The Shield functions well and has a great feel in hand when shooting. I have put 300 + rounds through it and no failures, hp, fmj, and even aluminum. Not much difference in recoil between 115 grain fmj and sig 147 grain hp. Thanks again Sportsman's! Another Happy Customer. Great selection at a great price, prompt delivery, just as advertised no surprises. Richies Pawn the FFL dealer the best around Ft. Lauderdale. The regular 9mm Shield with thumb safety and the Performance Center Shield with thumb safety, they're both excellent shooters. No problems. Had the best price on the net and free shipping. Then add in a $75 rebate and you can't pass on buying a great firearm at a great price. Shipping is also great but expect a week for it to be shipped. Overall a great experience with Sportsman! Would buy from again! I got a 40 when they first came out, 8-10 yrs ago. The mag would fall out upon recoil. There were recalls to address this. I am surprised to see that it is still a problem on some guns. It was well documented at the time. Owner and shooter of two fine Shields 45 & 9mm. Great carry, great reliability, Great shooters. Zero issues. Haven't fired it yet. The recoil spring is still very resistant to human retraction and the takedown lever is a thumb bruiser. But the pistol has a perfect feel that S&W has masterfully created in their entire M&P line. Sportsman's almost always has the best offers, and I check them out first thing. They're slightly slower in responding to orders, but I think it's because they're selling so much merchandise. Ordering my first firearm online was a new experience for me. Sportsman's Outdoor Superstore was so easy. They immediately confirmed my order by email. The product was shipped in about 5 days. I was given a tracking number and it provided FedEx tracking page. Very polite people to help you when you call their store. My FFL store assured me I would have no issues with SOSS. I recommend them when ordering online, plus I saved so much money. Outstanding weapon. I scurried the world searching for one of these pistols at a price that was just close to to this price. I wanted to buy local. Gave everybody a chance, and no one could get within a hundred dollars. Then the $75.00 rebate on top, I bought two and I might get one more. Pros: Light recoil for its size, 3 dot contrast sights stock, easy takedown, nice smooth trigger pull and reset, easily concealable, lightweight, comes with an 8 and 7 round magazine. Cons: Slide may not lock back after last round on occasion 4 or 5 times on this one range trip, size creates difficulty in control, extremely stiff slide release, small external safety. If you're looking for a lightweight, accurate, reliable firearm specifically for concealed carry then look no further, especially at the price of $299.99. Its thickness 1 inch does make it more difficult to control, especially when using the 7 round magazine, but once you get used to it shooting is easy. Personally, I feel the M&P Shield in 9mm easily beats its competitor, the G43, because of the stock advantages in magazine capacity. Sights get with it Glock, having the option of an external safety, and the trigger. The M&Ps are a very good make. Very solid, and reliable by review. In Northern VA where I live, the price is like $400 and up. So, after searching around, I came across SOSS and was like wow! $224 with the rebate. I would be a fool not to take advantage, so I purchased one. The one minor issue, and I do mean minor, is that I'm a lefty, which means the slide lock is a little difficult, but I'm strong enough to deal with that. The mag release is on the left, but that's not a problem. The middle finger takes care of that. And with the practice I'm putting in, along with the great videos that are online for help makes it a win win...If you don't have one, get one. You won't regret it. P.S. Thanks SOSS for putting forth great deals. I purchased one of the 9mms with the thumb safety. I have been shooting for over 40 yrs and if you understand the concept of Muscle Memory, you will understand why a 1911 shooter wants a weapon with a thumb safety. After my 1st Shield, I purchased THREE more of the same weapon on sale & rebate for my wife and to place in our vehicles. My wife also loves this pistol and is accurate with it. She has smaller hands, and this frame fits the web of her hand between thumb and index perfectly. ALL FOUR pistols were tight at first. If you will put 400 rounds of FMJ range loads through it you should notice a smoother trigger and slide release. We use Speer Gold Dot as our defense load and each of the pistols feed fine; not one single issue. For $224.00 AFTER the rebate and a lifetime guarantee, I just don't see where you are going to find a better weapon for a quality self defense pistol. (5 out of 5) Is it worth it? YES! BUY THIS! I can't come up with 1 negative thing to say about this pistol. I carry it every day. Forget it's even on me most of the time. The PERFECT CCW gun. Very good transaction & fast shipping. Put about 150 rounds as soon as I got it. No issues. Now is time to train the wife. Owned this gun with the safety for 2 months. Shoots consistently, feels good in the hand, and shows no printing when wearing CC IWB. A very nice feature is you can rack the slide with the safety on. This way, one can load a round, add one more round to the magazine, then CC with either the safety left on or taken off as desired. Great sale price plus rebate was a deal I could not pass up! Completely satisfied. Received my 9mm Shield within a few days of ordering. Put 200 rounds through it with no issues. Very accurate. Fits my medium sized hands nicely. Perfect for CHL holder to conceal and carry for light weight, small size and durable build. Quick shipping, great price! Could not ask for more! (5 out of 5) Yes, You Should Order This One! I was hesitant to order my first handgun online, but buying the Shield 9mm was a great decision. Put about 200 rounds through so far, great performance. I will be ordering from here again. (5 out of 5) Excellent concealed carry choice! The S&W Shield is an excellent choice for concealed carry. Superstore is a great place to purchase thru as well! Easy, smooth, seamless transaction!!! I have smaller hands but great feel in my hands. Have gone through about 150 rounds so far and no jams or issues. Only knock is it's hard to slide and loading the magazine gets hard to load all rounds, as it gets very stiff after loading 5. I love the gun so far. Plan on replacing my Ruger LC9s 9mm once I get the Shield broken in. It's a tad larger than the Ruger, which is better for me; I have large hands. Although my shot groupings are tighter with Ruger, I attribute only having 300 rounds practice to that. I ran about a dozen different self defense ammo brands through it flawlessly. Larger sights than Ruger, which I also like. I also have an S&W Compact 22 which is a blast to plink with, and the old reliable Glock 19 for home D.
Customer service is great. I recommend Sportsman's outdoor Superstore to everyone. You won't be disappointed. I picked up my M&P SHIELD today and I'm very happy with my decision to go with this gun. I'm sure I now have a new best friend...very light and comfortable . It's light and small, but it's not better than a Glock 43, XDS, Sig or Kimber. I've shot 4 different Shields, and all have issues with misfires, stovepipes and mag drops. I wouldn't trust my life with one. I purchased the XDS and can honestly say it's worth the extra coin for a better gun. I purchased my Shield from Sportsmans and the transaction was without problem. First trip to the range and the Shield had no malfunctions in the first 200 rounds. It was very accurate and since it is a 9mm, recoil is not an issue, even in a compact platform like this. It gets even better with the MagGuts Plus 2 extension. I used the MagGuts on the 7 round mag and it is now 9+1 and still shorter than the 8 round mag. This gives you a very slim single stack with mag capacity approaching some double stacks. There is a reason this fine American made firearm is selling so well. This is my 2nd 9mm. The first is a bit too big for CC. This one is more suitable for concealment. I found the trigger to be too rough. I followed the online instructions to polish critical surfaces to smooth out the pull. The only problem I encountered was removing the rear site. I really do not think it was necessary to make it so tight that special tooling is need to remove it. After buying a brass punch, I finished the job. It did help a great deal, but I would still like the pull to be a bit lighter. Overall, I like the performance and would recommend it. I own two of these accurate and flawless performing weapons. (5 out of 5) My first 9mm pistol!! This is a way overdue review. I bought this pistol a few months ago March and have fired it a few times already. I love this S&W M&P Shield 9mm. I have already made another purchase from you guys. Great service! I have over 1000 rounds from my Shield 9mm. Not 1 single issue. The trigger has gotten a bit easier. I have no complaints at all and do recommend this gun. (5 out of 5) Great pistol for Conceal carry!! Great customer service!! Got pistol within 2 days from order being processed! Very accurate pistol!!! I love it! This review is about S&Ws lack of QC and attention to detail. The gun arrived ok without damage or marks, packed better than my full-size was. Trigger feels like there is dirt in the gun and the mag does not fit tight in the gun. There is a gap between mag and gun frame larger then needed, could be tighter. Will be going to range and see if the gun loses up. Will be looking for a replacement soon. 2 years or so ago I was shopping for a compact handgun for carry. I finally went with the Ruger SR40C. Well, here I am writing about the Shield 9mm. Although I wouldn't say buying the Ruger was a complete mistake, I wish I'd just bought the S&W to begin with. I've carried my Shield more in 2 weeks than I did the Ruger in the past 2 years. So, the Ruger will stay home. Why The SR40C is big and heavy for my taste, especially compared to the Shield. I took the Shield to the range and put about 100 rounds through it, target ammo and about 20 personal defense rounds. No issues at all. I really like the trigger and I was able to shoot quite accurately. 3rd big purchase from SOS. Perfect transaction again. I bought this pistol because I was looking for a single stack to replace my other CC and found this to be a great option! It's light, thin and shoots very smooth and accurate! Which is why my wife is carrying it now! And she loves it for the same reasons! The reason I am writing this is to tell you how awesome the customer service is at SOS! I bought this pistol 10 days before it went on sale and called to see if I could get it for the sale price. They said they only honor the price if it is 7 days prior to purchase, which was no problem because I still got it for a great price. BUT, they went ahead and honored the sale price anyway! I didn't even ask a second time! Thank you SOS! I will be back for my .45 soon! I just purchased my 2nd Shield 180021. Sportsman's had one with a special frame I was looking for. They shipped it special the very same day. A friend bought 2 others with the specific frame types the next day. They were exceptionally helpful and accommodating. Will purchase again from Sportsmans anytime. Exceptional and kind service, help, and speedy. Product is great as well. (5 out of 5) Great 9mm for the $$$!!! Just got this gun. After many recommendations, I decided to buy. So far I am impressed! Shoots great, lightweight and easy to conceal. It breaks down very easy for cleaning and oiling. The S&W M&P 9 Shield is the second gun I have purchased from Sportsmans Outdoor Superstore. Once again the price was right the gun was priced $60 to $100 lower than what I would have spent locally and the shipping and service excellent the gun was delivered to a local gun shop on the 4th day after ordering and I had it in my hands less than a week after ordering. The M&P 9 Shield is what I had hoped it would be - comfortable to handle and shoot and flawless in performance. My only surprise was that I found myself shooting 4 inches low at 20 to 25 feet consistently for the first 50 rounds. A little research on a few Internet pistol forums revealed that the factory sights are configured for a combat hold sight picture and not the 6 o'clock sight picture that I am used to with my other pistols. That correction made a world of difference. With a bit more practice I should be able to attain the tighter groups that I get with my other pistols. (5 out of 5) Great gun to carry. I ordered my gun and it shipped the same day. When I got the gun I ran 150 rounds through it without any problems at all. The gun does take a little getting use to if you have bigger hands. The gun is more accurate than I am. By the end of my range time I was shooting 4 out of 5 rounds touching at 7 yards. So I was a little worried about the size of the gun for my hand while wanting something that would conceal well. Since concealment was paramount I went with the Shield. I could not be happier. I added the Pearce magazine extender and it makes for an excellent fit in my large hand and a great CCW piece. I also added Talon rubberized grips and the feel is just incredible. More like an extension of my hand, very comfortable. I really like how concealable the firearm is, I use a Kestrel carbon fiber IWB holster with a tuckable strut and even with just a T-Shirt you would be hard pressed to tell I am carrying. The gun itself is smooth and effortless, extremely accurate out of the case. I have run 500+ rounds through it with no issues. The only issue I have is with the take-down-lever. That just seems like more trouble than it is worth. I don't like to dry fire to clean but have found myself doing just that to avoid the TDL. Overall just an amazing weapon and I am looking forward to a long and happy relationship! Oh and the Sportsmans Outdoor Superstore is my place to buy a Firearm. Customer service is second to none and they are extremely quick and efficient. I have already purchased 3 guns through them. Can't imagine buying from anyone else. (5 out of 5) Favorite CC gun of many! Purchased the Smith and Wesson Shield over one year ago! It quickly became my favorite concealed carry gun. I have never had a stove pipe or jam with it after shooting several rounds of various types of ammo through the gun. I would also say that Sportsmans Outdoor Superstore has the easiest and fastest standard shipment times of any online company I have dealt with! Thanks again for such a great online experience! To celebrate I just purchased another fine handgun from you this week! (4 out of 5) shield 9mm WITH thumb safety. I just got my Shield in. I have never been so disappointed. I got the thumb safety version. I had to place my order three times to get the gun due to my own ordering ignorance but the second time I ordered it was still the no thumb safety version. Well now I finally got the order approved. This was meant as a gift and I used my own credit card to purchase for a friend. Apparently this is not acceptable. Again I do not hold this company responsible. After the third order I recieved the gun very quickly and in great condition only to realize the last time I ordered the thumb safety version. I still have to say this was my fault but it was depressing. Anyways no fault to the company or gun but pay attn to what u order because the details are very small and not verified on purchase. I will not complain Any more because I feel at fault but pay attention. There is no warning or large type to even warn u or ensure that u are getting what u meant to. (5 out of 5) Recommended EDC and acurate all around pistol. I ordered my Shield on a friday afternoon and received it on the next tuesday! I give a lot of credit to SOS for the very fast shipping. I definitely be buying more toys from them in the future! My first M&P gun and will not be the last. I put 7 of 7 on a B-27 target from 50 yards on my first outing. Hit 2 of 8 from about 100 yards! Sweet shooter! This was my second order with Sportsmans Outdoor Superstore and once again had an excellent experience with customer service. Firearm shipped within two days at a good price and in good condition. I will continue to do business with this company. Perfect firearm. No complaints whatsoever. Perfect service, and shipping. Ive put about 1000 rounds 9mm thru the S&W Shield. Varying ammo manufacturers, grains 115, 124, 147 and bullet type FMJ Round Nose, JHP, FMJ Flat Nose. There hasnt been a single misfire or feeding issue. Accuracy is great. Absolutely no issues with the gun. Its very comfortable for CCW and it doesnt print at all with my IWB holster. The grips are comfortable and it points well during presentation. Highly recommend this gun! Great little carry pistol, at a great price! (5 out of 5) Incredible value ! I bought this shield 9mm for my wife to use as a purse carry. She likes the 9mm platform, and we have other S & W polymer frame pistols that we are comfortable with. I took it to the range to test it out today while the Mrs was out of town, and Im stunned as to how comfortable and accurate it is. Pie plate at 10 yds, every round was a winner. Fast follow up shots, no mis-fired in 150 rounds, and simply felt right. I cant imagine the Mrs not falling in love with it when she tries it out. I may have to get one of these for myself too! I would argue that this is the perfect concealed carry weapon if you live somewhere warm. The print is marginally larger than an LCP, but I can get 2 groupings at 15 yards, which is far better than I am able to do with other subcompacts G26, LCP, LCR. I prefer the Shields trigger pull over the longer pull of the Nano and LC9. The only issue to date was that the white dot on my front sight fell out on my first trip to the range seems to be a common issue. I bought some white model paint and used a toothpick to fill it back in. Works like a champ. I carry it every day. This was my first order through Sportsmans Outdoor Superstore M&P Shield 9mm and I am very pleased with the company and overall service. Gun is exactly as described, I love it. But mainly reviewing the fast fast shipping 2 day fedex, went out day after I ordered...and the shipping was free...cant beat that and overall hassle free experience I had with them. Also the best deal I could find on the net by far for this gun....unfortunately my stupid FFL had a $45 transfer fee!! But thats another story. Thanks again, Ill be back soon. To be honest I wasnt a big fan of the small framed semi autos until this gun hit my hand. It feels like it belongs there, its part of you. And its is perfect for that night out on the town or a quite dinner for two you know when a Glock 23 is just to big. First shots dead on and after 100 rounds she was getting better, smoother with each pull of the trigger and I didnt even wipe her down I just removed her from the box and started shooting. My wife a Kahr PM9 fan said she loved the trigger on it and I have to agree. Overall Im very happy with this purchase so much so that Im selling my xds when I get it back. Great customer service on ordering & receiving my shield from the Sportsmans Store. The gun itself is everything as good as everyone is talking about. Online forums have a lot info on the gun itself & how to improve it. This is my most favorite gun. (5 out of 5) The perfect pistol. Id waited over a year to finally locate a S&W M&P Shield due to them being quite scarce because all of the hype. I finally got one ordered through Sportsmans Outdoor Superstore, an excellent purchasing experience/transaction I might add and now I get what all of that hype was about. This gun fits the hand SO well, shoots smoothly/accurately and fires EVERY time you ask it to. If youre considering one DONT hesitate, they really are THAT good. Took my new shield MP to the range and after the first magazine, it started dropping the magazine. Sent gun to S&W, where it was determined that the Mag Release Spring hadn't been tempered and there for wasnt acting like a spring. And, unfortunately, due to the way that the spring was attached to the frame, the weapon would have to be replaced. So, theyve had it for 3 weeks, and tell me that it will be AT LEAST...AT LEAST...another 2-3 weeks before they can get a gun and ship it to me. When I asked why, I was told, well your not the only one waiting. So, it looks like this repair is going to deprive me of the use of my gun for 6 weeks to 2 months. Not a happy camper.